It was Songkran Festival once again in 2015, and there it came “Chill the cities in the Great Songkran, Relive the tradition”. JSGT still relived its concept of embracing Thai culture. Moreover, JSGT also places its importance on older persons. We believe that older persons in each communities are wisdom of the community and their existence represents the experience being accumulated within the community. 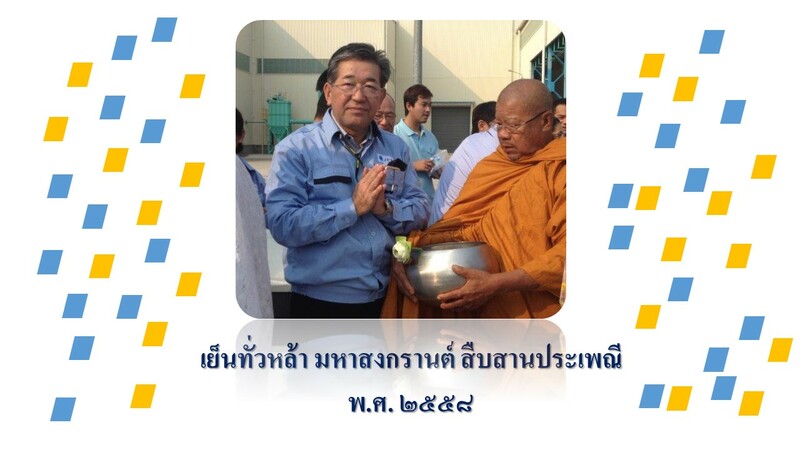 This Songkran, as it is the National Elderly Day, JSGT had made the contribution to the elder of communities surrounding. On 7th April 2015, JSGT had contributed a greater cooperation with Ta Sit Sub-district Administrative Organization through bathing ceremony for the elders in the communities for the year of 2015 with its mean to preserve the Thai traditions and customs, by granting the electrical appliances for the sub-district administrative organization. On 16th April 2015, JSGT has recognized the importance of Chomphol Chao Praya Municipal Office’s operation for the reason that, for a community to grow and to develop, they are the mechanism that drives. Therefore, on the occasion of Songkran Festival, JSGT had granted partial budget to the municipal office with its objective to hold an event for the National Elderly Day and the Songkran for the year of 2015. We expected that the municipal office could serve to enhance the uniformity within community. We are looking at Songkran as Thai new year and a great chance to start up, so we could face with challenges coming upon in our work life and with a smile and great support from our management, we are driven to make it possible and eventually reach our goals.